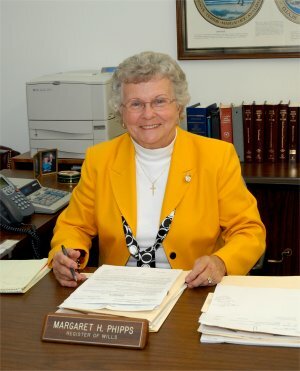 The Honorable Margaret H. Phipps was first elected as Register of Wills in November 1978. She is the 24th Register to serve the citizens of Calvert County. "Efficiency and cost effectiveness remain foremost in my efforts to serve you. The Register of Wills does not set policy; however, the Register must know probate law and deals constantly with death and grieving families. Compassion, knowledge and experience are so important. My door is always open to assist YOU. My staff and I will continue to provide compassionate, professional, courteous and confidential service to ALL"